CWC Recruitment 2019: Good news for the Aspirants looking for Central Government jobs, now Central Warehousing Corporation (CWC) published an official notification for 571 post to fill the Junior Superintendent, Superintendent, Management Trainee and Various, work in anywhere in India. Candidates must go through the official CWC recruitment notification thoroughly before apply for Junior Superintendent, Superintendent, Management Trainee and Various post. CWC Junior Superintendent, Superintendent, Management Trainee and Various job application is collected through Online mode only. In the recent Recruitment Notification, the following vacancy details given by the Central Warehousing Corporation (CWC) and aspirants should go through the vacancy details and eligibility details for more detail in CWC notification link given below before applying. Aspirants meet the education qualification of Central Warehousing Corporation (CWC) only apply for the Junior Superintendent, Superintendent, Management Trainee and Various job. CWC notification 2019, education qualification are given below. Accountant B.Com or BA (Commerce) or Chartered Accountant or Costs and Works Accountants or SAS Accountants. Superintendent (General) Post Graduate Degree in any discipline from a recognised University or Institution. Junior Superintendent Degree in any discipline from a recognised University or Institution. Management Trainee (General) Degree with 1st class Master of Business Administration, Specialization in Personnel Management or Human Resource or Industrial Relation or Marketing Management or Supply Chain Management from recognised. Management Trainee (Technical) 1st class Post Graduate degree in Agriculture with Entomology or MicroBiology or Bio-Chemistry OR 1st class Post Graduate in Bio-Chemistry OR Zoology with Entomology from recognized University. Assistant Engineer (Civil) Degree in Civil Engineering. Assistant Engineer (Electrical) Degree in Electrical Engineering. Hindi Translator Master’s degree of a recognised University in Hindi/English with English/Hindi as a main subject at the degree level. Junior Technical Assistant Degree in Agriculture or a degree with Zoology, Chemistry or Bio-Chemistry as one of the subjects. Aspirants who want to apply for CWC Junior Superintendent, Superintendent, Management Trainee and Various 2019, must attain the following age limits given by Central Warehousing Corporation (CWC). The application fees for Central Warehousing Corporation (CWC) Junior Superintendent, Superintendent, Management Trainee and Various 2019 differ according to various categories. The application fees details for CWC Junior Superintendent, Superintendent, Management Trainee and Various given below. 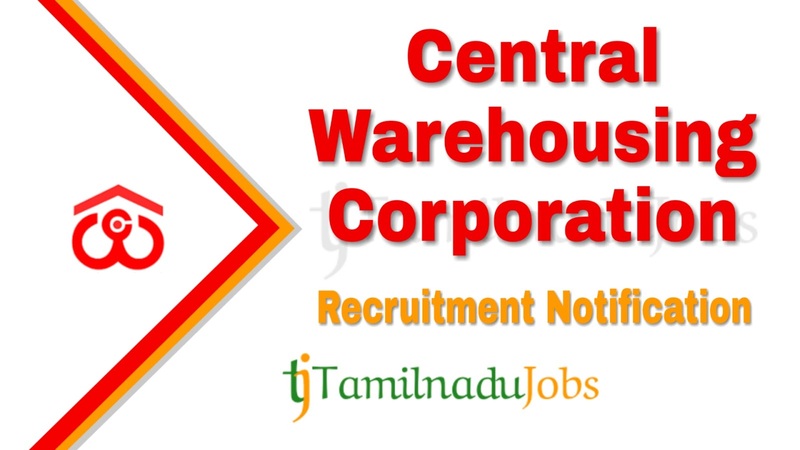 Central Warehousing Corporation (CWC) is announced the recruitment for the Junior Superintendent, Superintendent, Management Trainee and Various to full fill their 571 posts. Aspirants have to pass the following selection process given by Central Warehousing Corporation (CWC) to get Junior Superintendent, Superintendent, Management Trainee and Various job. For more detail and correct information check in the official notification of CWC. How to Apply CWC Junior Superintendent, Superintendent, Management Trainee and Various 2019? Step 3: Fill the details required by CWC in the form. Step 5: Before submitting the application for Junior Superintendent, Superintendent, Management Trainee and Various, check the details are correct, then press submit and pay the application fee.